Christopher’s post is taking a definite turn to the nostalgic. Who’s used any of these? Never used any of them myself but remember being around and about when some of them were used. For the first, we stayed with my maternal grandparent for about six weeks between Dad’s postings. 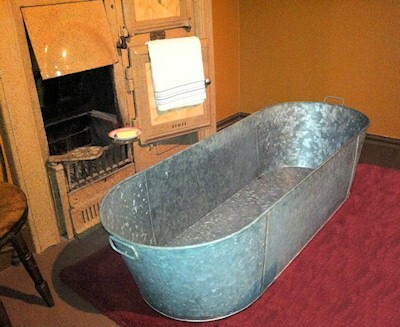 The bath was kept in the outhouse and brought into the kitchen for Grandad’s bath on a Sunday night. We were always sent to bed before the ceremony. The range was black and lovingly tended by my youngest aunt,Granny having passed away. Hot water by the bucket. Know what the second is but we never had one. Pity. I was too young for skiffle the first time around but could have been right in there for the revival, had I but had one. .
We had third, fourth and fifth in our scullery in Perth in the mid-50’s. That is a smell that really brings back the memories. And never on a Sunday in Jockland, Bravo. Monday for washing followed by drying, airing and ironing as the weather allowed. I miss the wringer, Bravo. Fond memories of my wee granny sweating buckets over it. She was tough. JM, I still call it the scullery. Kitchen? Nah. Yes, TR, definitely the scullery. 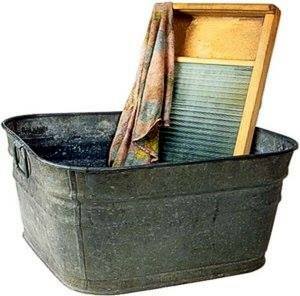 As a toddler, I used to get bathed in the tin bath in front of the wage – once a week whether I needed it or not. I remember when teh bathroom was built onto our house with a cutting edge gas geyser. The scullery was always a separate room off the kitchen in the soft East of Scotland. I feel for you in the deprived West. I remember the once a week baths, Bravo. The smell was never a problem. The world did go bad when we started washing every day. Aye weel, JM, the 3 deprivers are still in the cup. The West’s finest are at home to St Johnstone. Bloody Sellick. I blame us. C’mon the Jags and the Arabs. And, I am sorry to admit, the Saints. My Perth loyalty persists, I was there on the terracing at Ibrox on a bitter Wednesday night in the 1960’s when we beat you to confirm our second place in the league. No smell apart from the Irish tricolours that you had captured on the previous Saturday at the Old Firm game and were burning just to keep warm. I can’t blame you for that. Got you all beat, in my place in Aberdeen I had an outhouse scullery that needed a fire lit under it!!! AND I used it regularly! 1968-70. All those pictures are of very modern equipment back in the day. Until 2000 I was cooking on a solid fuel rayburn, wonderful, kettle always humming on the hob, endless hot water, I generally used wood as it was free but that necessitates putting on your dinner at 10. in the morning, you have to be very organised! I kept coal in too for baking when I needed a temp of 350+. The advantages of a gravity feed system with a few radiators is marvelous, keeps going through power cuts! Anyway anyone who still spins real wearable clothes from off the back of any creature a la 17th Century style is atavistic beyond any reasonable point! I reckon you could drop me in any century and I would function quite happily, its the bloody future with all the moronic electronic claptrap that gives me the heaves. Thank God I’m getting old and haven’t got to bother with it all! I always rather fancied times when you were allowed to poison people creatively and get away with it if you were clever! If, as and when, I ever get back to Wales I shall insist on a multifuel rayburn style system, you can actually get them that switch from solid fuel to oil, marvelous! It is so boring being cold. and the electricity is so unreliable in the outer marches. PS had a bathtub like this at Uni, we rented a house with no bathroom, outside loo , rent minimal. We used to set it up in the kitchen and all share the water, girls first! But then nobody had any loathsome diseases in those days!!! One fought for space with the euphonium, the cat lived in the euphonium and used to puke into the bottom, quite hysterical retrospectively. On reflection one might just have been called eccentric, it never seemed so back in the day. That is what comes of being born very late to well past it parents. For heavens sakes my father could remember the last Boer War, 1902-04! PPS In that house, one Mike Phillips from Swansea lived with his motorbike, he took it apart on his bed and slept with it for the rest of the year. Well one up from sheep shagging one supposes!!! CO, you’re such a softie! Central heating? Never as a lad and college rooms had gas fires with slot meters. First had CH when I bought a house in 1966! j the old man lost most of a leg in WWI, net result his circulation was very poor and always felt cold. He used to stoke the thing on anthracite like a maniac. The house was always 75-80, ridiculous tropical heat. We had a better coal heap than most mines, always had two tons delivered at a time so he didn’t run out! If number 4 is a gas heated washing machine – I bought an ancient second-hand one when I got married, first time around, having dumped a twin tub as being far too messy – it dripped water everywhere. It heated the water wonderfully, but was a pig to empty because one had to empty it into buckets. Being of a rather impatient nature, I often slung the bucket of water into the sink somewhat too energetically so that it very often splashed back and soaked me. I knew it wasn’t going to hang around very long. The final straw was when I left husband no 1 in charge of the washing. He decided that everything needed boiling and that the dirtiest items should go in first. Thus, his green corduroy trousers, which I had made, went in first – and were boiled to almost half their original size. They were followed by the nappies, which were boiled to a pale sludge green courtesy of the green trousers. A few days later, I bought the latest, most expensive top-loader and tumble dryer. It was called a ‘copper’ Boa. Ours wasn’t as posh as the one in the picture, just galvanised tin with no enamelling. I guess they were originally copper objects. All of them seen, and well used in the young Wattage house. We too had a remote scullery with its own coal fired “copper”, a brick built object with a cast iron cauldron built in with a wooden lid. Hot water was bucketed into the galvanized tub and the parents got first dibs. When the kids were done the tub was dragged out into the yard and dumped on the ground by my father, after a while this misuse had rubbed a hole in one end of the tub, his solution to this was to pour half a bag of cement into the bad end of the tub and let it set. I made very sure I got the smooth end after that. The only toilet in the house was attached to the scullery, a bog standard bog, chain operated, wooden bench seat, no light, no heat, and often no paper (even that greaseproof “San Izal? stuff” would have been welcome. All wonderful bladder training during the winter months. 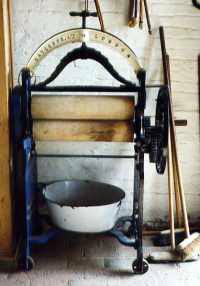 The wooden roller “mangle” lived out there in the scullery with the other essentials. 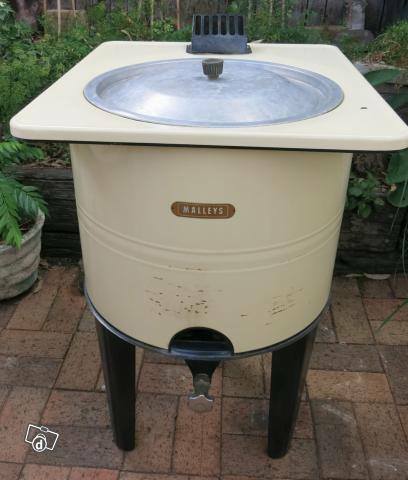 I bought my mum her first washing machine after I moved to Canada (post 1970) Even thereafter drying continued to be done outside in good weather and otherwise inside around the fire or hanging from a frame from the ceiling (it had a name too but I have long forgotten it). In row house South Wales coal was carried THROUGH THE HOUSE to the back yard bin together with bicycles, dustbins and anything else that needed to get back there. My father and I demolished the whole shebang in the late fifties and built a proper kitchen and bathroom on the back of the house, I remember happily drilling holes in asbestos roofing so that he could screw it down. We got permission to break open a gate in our back yard wall and take rubble and bring materials through from the rear. It was an army depot back then, the gate stayed, the army depot did not and we finished up with the only house on the street with a back entrance (posh eh!). LW, standing it was called a clothes horse, hanging on pulleys a very memorable term which I forget! LW frame from the ceiling=airer. Everybody I know in Wales still has one, even brand new houses put them in their utility rooms. Those you can still buy new with the cast iron ends and slats on a rope. Jolly useful too with the weather there. I’ve still got a clothes horse, its in the flat in Brum. CO/Janus: I think it was a brand name of the ceiling device I am trying to recall. The only references I can find call it a “pulley” or a “clothes maiden” but those were not what my folks called it. I have seen these, but haven’t actually used them.